Deborah Oropallo was born in Hackensack New Jersey. She received a B.F.A. from Alfred University and an M.A/M.F.A. from The University of California, Berkeley. 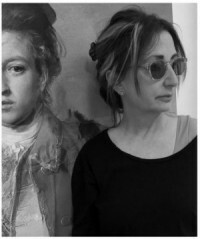 Although originally trained in painting, Oropallo’s practice incorporates mixed media including photomontage, computer editing, print technique and paint. Her composite works utilize layered visual sources to produce a dense interplay between time, place, form and content. The resulting works bear traces of the distortions that evolve or remain from digital manipulation and removal. Oropallo’s work has been featured in solo exhibitions at the de Young Musuem, the Boise Art Museum, Montalvo Gallery, and the San Jose Museum of Art. Her work has been included in group exhibitions at the Whitney Biennial, The San Francisco Museum of Art, the Corcoran Gallery Biennial, the Jewish Museum, and the Richmond Art Center. Oropallo’s work has been featured in two monograph: POMP (2009) published by Gallery 16, and How To, published by the San Jose Museum of Art. Oropallo is also a a recipient of a National Endowment for the Arts Award, a Eureka Fellowship from the Fleishhacker Foundation, the Engelhard Award and a grant from the Pollock-Krasner Foundation.